Hellenic Petroleum’s Chairman of the BoD Mr. E. Tsotsoros referred to 31/10 as “An important day, which signifies a change in Greece’s energy landscape and may act as a springboard for the country’s international competitive presence, with the production of Hydrocarbons being the starting point”. 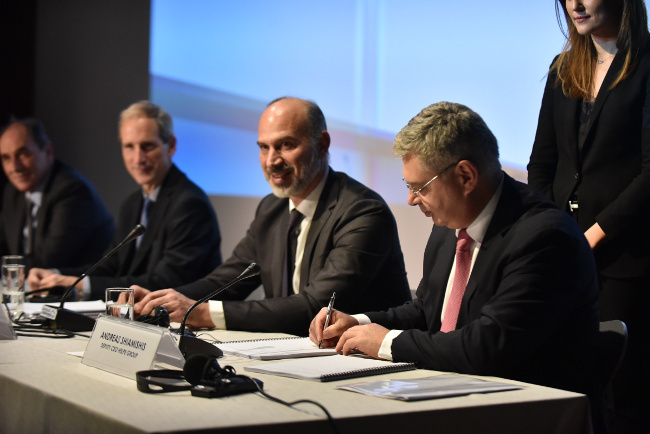 Mr Totsoros’ speech was delivered at noon, at the signing ceremony of the Lease Agreement between the Greek State and the JV between Total (operator) - Edison - Hellenic Petroleum, for the granting of the Exploration and Exploitation Rights to the Ionian Sea’s “Block 2”. The Lease Agreement was signed by the Greek Minister of Environment & Energy, Mr. G. Stathakis, Total’s VP for the Caspian Sea and Southern Europe, Mr. Bernard Clement, Hellenic Petroleum’s Deputy CEO, Mr. Andreas Shiamishis and Edison’s Executive VP of Research & Production, Mr. Maurizio Coratella. 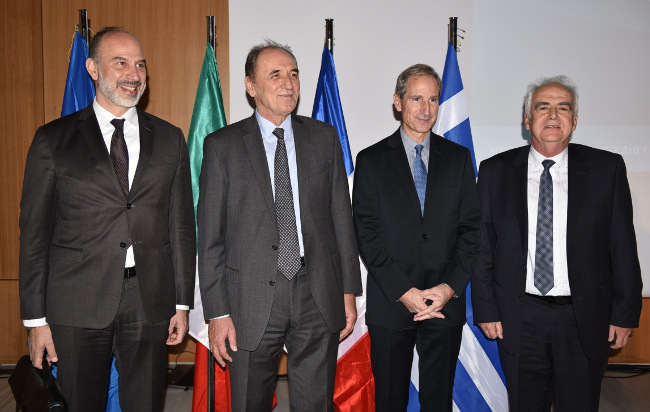 During the event, speeches were delivered by the Ambassadors of France and Italy in Greece, Mr. Cristophe Chantepy and Mr. Efisio Luigi Marras. In addition, former Greek Minister of Energy Mr. Yiannis Maniatis, Regional Governor of the Ionian Islands Mr. Theodoros Galiatsatos, and MPs Hara Kafantari, Aphrodite Theopeftatou, Foteini Vaki, Konstantinos Pavlidis, Dimitris Dimitriadis, Olympia Teligioridou and Haris Theoharis were present, as well as the Chairman and CEO of HHRM Mr. Ioannis Basias and VP Mr. Spyros Bellas. 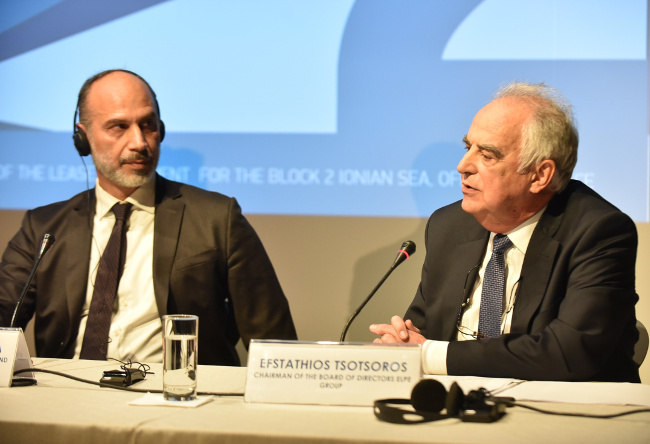 During his speech at the new building of the National Library of Stavros Niarchos Foundation, HELPE Group’s Chairman of the BoD Mr. Tsotsoros, noted that “the case of Block 2 in the Ionian Sea will be the subject of studies in the future and will serve as a representative example of the pathogenesis of the Greek political-economic system, as it took more than 30 years since the discovery of this promising geological structure, to reach today's concession contract." He reiterated, however, the constant determination of HELPE Group to actively contribute to the transition “from myth to reality" of existing oil and gas reserves, which will geo-strategically upgrade Greece's role in ensuring the adequacy and security of the energy supply of the EU. According to Mr. Tsotsoros, the signing of the agreement confirms the right path of the political leadership's reform efforts and, at the same time renders the strategic goal of Hellenic Petroleum for the creation of a significant portfolio of participations in "oil-rich areas" of Greece with leading international groups realistic. At the same time, this agreement finally justifies the long-standing, persistent effort of Hellenic Petroleum’s high-level group of technicians, headed by Mr. Yiannis Grigoriou, in regards to the promotion and exploitation of our country's hydrocarbons. Hellenic Petroleum’s initiative to design and promote this project is also justified by the participation of Total and Edison. The former is one of the world’s leading companies with pioneering and suitable technology conderning successful drilling in Deepwater projects, while the latter possesses extensive experience in exploring similar geological formations on the Adriatic Border. Additionally the presence of these companies ensures that the strictest regulations are adhered to protect the ecosystem, aiming at zero environmental footprint. “HELPE Group’s ability to support active and long-term ventures at this level is further accredited," mentioned HELPE Group’s Chairman of the BoD, pointing out that the Group’s highly profitable results and high cash-flows over the last three years (2015-2017), have created a particularly positive climate in regards to the development of International cooperations. These prospective coperations are further facilitated by the completion of the Third Assessment, which considerably limits the investment risk. The improved conditions that have now arisen, make the situation more favorable in the light of the expected ratification of the Lease Contracts of Arta-Preveza, NW Peloponnese and the sea area of "Block 10" in Kyparissiakos, as well as the important announcement of the new tender for the sea area north and west of Crete, following the application for expression of interest from Total (operator), ExxonMobil and Hellenic Petroleum. However, Mr. Tsotsoros emphasized that "the prospect of success of this important project requires effective synergies between the public and the private sector, the rapid completion and consolidation of the state's reform and modernization interventions in legislative, regulatory and fiscal framework, limitation of the timeless bureaucratic delays and inherent stagnation and, finally, to take further actions to upgrade the level of the Evaluation Committees so as to decisively limit the time required for the signing and then the ratification of the Lease Contracts. "